Too often, city planners and political leaders give in to these assertions and try to appease the vocal minority of residents who espouse them, scaling back their efforts to make streets safer and more bike-friendly. 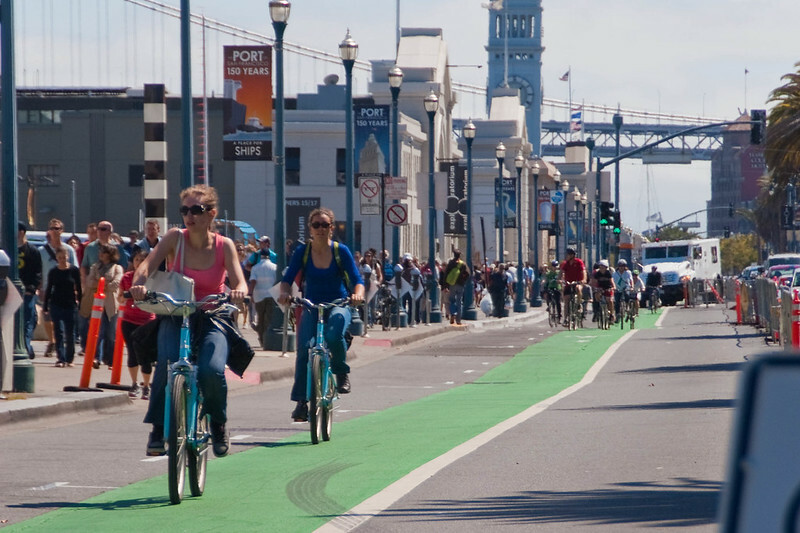 But the results of a new poll released yesterday indicate that a significant majority of San Francisco voters think the expansion of protected bike lanes, bike-share, and other efforts to make bicycling more attractive should be a high priority for the city. This kind of public opinion data can be extremely useful for city officials, planners, and bicycling advocates to bolster the case for such efforts, rather than allowing the conversation to be framed by the pre-conceived views of a few curmudgeons. About three-fourths of voters believe bicycling is good for San Francisco and that bicycling in the City should be comfortable and attractive to people of all ages, from small children to seniors. And voters are not just generally supporting the idea of bicycle riding, but are already out there riding a bike regularly. 43% of voters are already riding a bike, with 25% of voters in San Francisco riding regularly, meaning a few times a month or more. Two thirds of voters support expanding the bike sharing program to 3,000 bikes to serve San Francisco’s neighborhoods. More than two-thirds of voters support the City adding physically separated bikeways to improve safety and traffic flow and to create clearly delineated space for road users. Twice as many San Francisco voters are are likely to ride a bike on protected bikeways (56%) than on streets with no dedicated bike space (27%). Not only do voters support policies to expand bicycling, there is an urgency to their support – with 62% support for increasing the total number of all trips taken by bike to 10-15% in the next five years. Many voters (43%) would like to ride a bike more frequently than they do, including about 3 in 10 of voters who never ride a bike currently. 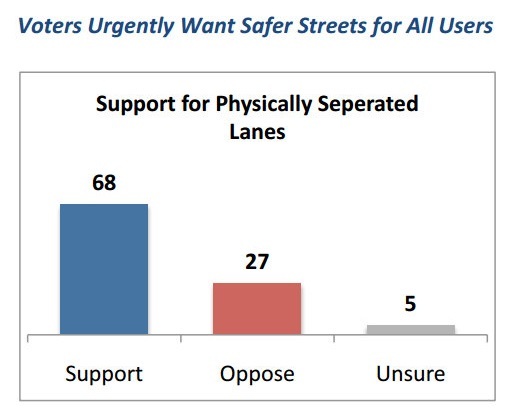 Unfortunately, 53% of voters view current conditions in San Francisco as unsafe for biking. As the poll results show, most San Franciscans get it: Re-shaping city streets to make bicycling more attractive is not about heeding the selfish whims of a deviant class of “cyclists.” It’s about removing the barrier of intimidating, car-centric street conditions and providing a healthier, more affordable way for a broad range of San Franciscans to get around town, benefitting everyone in the city — even those who never get on a bike. What we’re seeing throughout the city is a real awareness that more people biking is good for the city. Even for those folks that are never gonna ride, they’re going to benefit as more people bike. Because every time someone like me is on a bicycle, it means I’m opening up a parking space for someone else who needs it. I’m opening up a transit space for someone who needs it, and really helping the city become a safer, calmer, more beautiful place to live and move around. The poll results complement a growing body of local transportation data that bolster the case for prioritizing bicycling, walking, and transit on the streets. On several urban commercial streets — including Polk Street, Columbus Avenue, Geary Boulevard, and central Irving Street — surveys have already shown that the vast majority of customers arrive without a car. On all those streets, the proportion of car-free visitors has consistently come in roughly around 80 percent. As we’ve seen time and time again, making those streets more inviting to bike on will only increase the share of people who bike there, even if merchants don’t believe it. The potential for growth in bicycle use in San Francisco can already been seen in its most bike-friendly neighborhoods. As of 2010, the share of work trips make by bike among residents in Hayes Valley and the Mission was higher than 15 percent, according to the U.S. census. Neighborhoods with flatter routes that had calm traffic and bike lanes saw bike commuting grow by as much as 275 percent from 2000 to 2010, census data showed. From 2006 to 2011, citywide bicycling counts jumped 71 percent, according to the SFMTA, which plans to come out with an updated bicycle count by the end of the year. Check out a memo summarizing the Binder poll results in this PDF. This plainly evident poll demonstrates clearly that the vocal naysayers ARE in the minority, and relying on the tired old rhetoric that unfortunately DID work in less sophisticated times. It’s way past time for the abstract condemnation of new and different ideas, with no positive and constructive alternatives offered, to be themselves condemned by those in authority. Assuming the poll was properly conducted (no reason to believe otherwise), there are still very known dynamics on the political process that would get something (in this case, separated bike lanes) that enjoys broad low-engagement support into implemented public policy. For a starter, many general infrastructure projects have widespread support before they are translated into more detailed plans with some negative effects on some people and associated costs. Survey voters about things like “better BART service” or “smoother car traffic experience” or “more pleasant sidewalks” and you will likely get some high percentage supporting it. It is when this general support becomes specific plans with specific impacts and specific costs that things start to change. For a starter, opponents of new transportation infrastructure (of any kind) are often, for obvious reasons, much more vested and engaged on their opposition than the larger general population that supports the idea (of more bike lanes, in this case). These opponents will have to deal with impacts (reduced parking, for instance) and they have much more incentive to go out of their way (from attending meetings to throwing lawsuits around) opposing the project than supporters in general have reasons to go the same lengths supporting the project. That’s generally right, but I would think that it’s more obvious to respondents that the cost to car lanes of “adding physically separated bikeways” is more obvious than the hidden costs involved in “better BART service” or “more pleasant sidewalks”. But then again, I didn’t see how the questions were actually phrased, and it’s possible that people who don’t regularly read blogs like this one just don’t think about the need to remove one lane to put in another. Interesting results. One wonders if the SFMTA does their own polling and has come up with completely different numbers, otherwise what explains their remarkable foot-dragging on installing protected bicycle lanes via endless public meetings where endless tantrums by small numbers of people who desire car-based lifestyles apparently cow planners into believing they will have a revolution on their hands if they remove a few parking spaces, or, indeed, even charge for parking (i.e. institute an RPP zone)? The car-based way of life is ending, and this end is coming soonest in cities of any density in both North America and Europe. It turns out cars are worse for public health than cigarettes. It turns out they are enormous space hogs. It turns out they waste enormous amounts of energy to accomplish very little. It turns out two-thirds of the fossil fuels still in the ground need to be left there or our planet will become uninhabitable by humans. It turns out that walking and biking are good for the human body, even necessary for its health, and that the more one drives, the unhealthier one is and is likely to become. It turns out that more and more people can’t afford cars and their associated costs. It turns out people are willing to ride public transit if it’s convenient and pleasant. It turns out that the number of zero-car households is quickly rising in SF, as is the number of households with a single car used largely for trips out of town. And it turns out that walking and biking are forms of transportation that don’t need to be highly subsidized and so require very little in the way of new taxes. It’s pretty obvious that the support for bike lanes is only going to grow as baby boomers die off and all the new housing fills up with people under 40. It’s pretty obvious every surface parking lot, gas station, automotive repair shop, and car dealership in the northeast quadrant is going to disappear in the next few years, to be replaced largely by housing. (This includes most of the lots around the ballpark.) It’s pretty obvious continuing to enable car-based lifestyles, at least in the northeast quadrant of the city where density is increasing daily, isn’t going to work. And it’s pretty obvious providing goods and services within walking and biking distance of where people live, and then making it safe to bike and walk to these places, is the healthiest, greenest, most cost-effective investment the city can make. 1) Institute the proposed network of protected bike lanes completely in the next two years. This includes Polk Street with protected lanes in both direction. Ignore the howls of a few shop owners who will have more trouble parking their personal cars. They will be happier running shops in the suburbs where they live. 2) Close Market Street to private cars east of Van Ness. 6) Institute RPP zones for all neighborhoods in the city. 7) In our most congested areas, discourage car ownership and people from the suburbs bringing their cars here by gradually eliminating non-metered on-street parking. The alternative is congestion pricing, but most of the revenue ends up just paying for the monitoring system. 8) End the policy of mini-freeways south of Market. 10) Expand bikeshare rapidly across the city. Get business sponsors if necessary. 11) Reduce speed limit on residential streets to 20 mph. 12) Institute TEP recommended stop consolidations at a rapid pace. 13) Create tax disincentives to companies that provide employees with free parking. 14) If the city can make all stores charge 10 cents to everyone who gets a bag, the city can make all stores charge $1.00 to everyone who gets parking in an off-street lot. Free parking has far more negative environmental impact than free bags. Try these out as pilots, if necessary, open to review and improvement. Most of the above will happen, the only question is when and how much pain we’ll cause ourselves by fighting the inevitable in a futile effort to protect a way of life that was never particularly good and has now shown itself to be particularly ill-suited 21st century urban living..
“The	City	has	been	working	to	reduce	the	potential	for	conflict	between	people	biking	and	other	street	users,	and	to	improve	safety	by	separating	bicycling	traffic	from	motor	vehicle	traffic	on	city streets. There’s no mention of the cost of this, either in dollars or inconvenience to others. The respondent is given only the upside of a decision and asked if they are in favor of it.